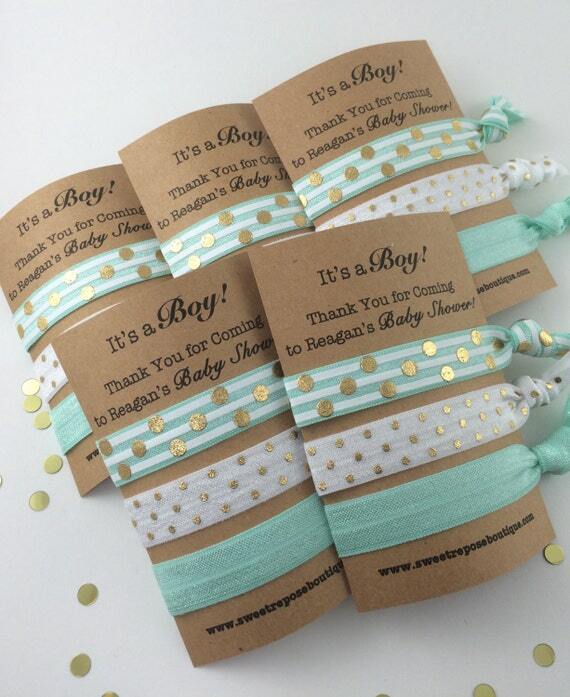 SMIDGE OF THIS: Baby Shower Planning ... Your Ideas? Ian and I think the world of Laura and her husband T, and we are also really excited that we will have babies that will be about two months apart in age. I'll be hosting at my home a shower for Laura with the other sisters -- my middle sister and one of T's sisters who lives in Columbia. We are getting our ideas all together and it's going to be a pretty and sweet shower! 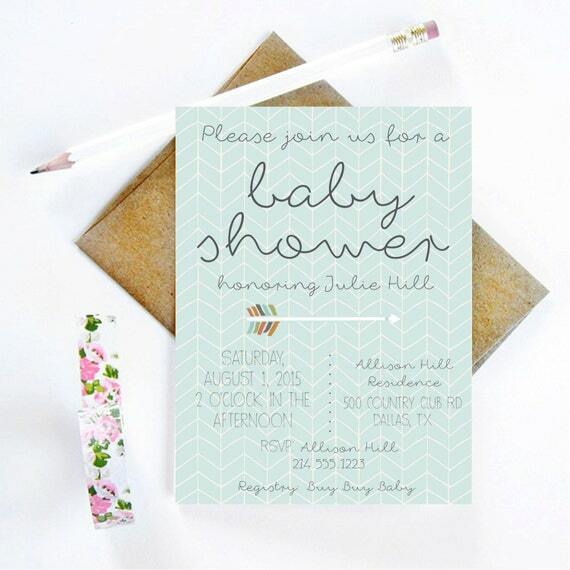 Here's where I love hearing from you ... what are some of your baby shower must-haves? I was torn whether to go with a boutique for the printing or whether to buy a digital file from Etsy and have it printed. I've done the latter before and then taken the digital file to the printer, have had the invitations printed on 8.5x11 cardstock, and then done all of the cutting myself. Coordinating envelopes were typically purchased at Paper Source. But a girlfriend told me yesterday that Staples has done her invitation printing before with marvelous results, and they come pre-cut and with envelopes! TA-DAAAA! I've received a few of her invitations so can definitely vouch for the quality of the paper and the printing quality. Would love to hear your tricks of the trade for invitations! I think we will keep the food fairly simple ... maybe some nice Southern classics like cucumber sandwiches, deviled eggs, and fruit salad cups. What are your favorite baby shower foods? I'll just use paper plates and paper napkins, and of course -- my favorite Dollar Tree find, the shiny metallic silver plasticware. Being that it will be a daytime affair, we will have some light adult beverages (maybe a tasty sangria? or mimosa bar?) and some sparkling waters or a lemonade. I am always all ears for great favor ideas -- have you received anything recently as a shower favor that you really enjoyed? I think to keep things simple, I'll probably just have a few arrangements delivered the day prior from The Bouqs. They have been my go-to source ever since I saw the concept on Shark Tank. I love their flat-fee pricing and gorgeous, high-quality flowers. They will come in boxes so they will be very easy to arrange in the key areas of the house that we'll be entertaining. One thing we'll definitely be doing is encouraging attendees to bring a small board book in lieu of a card. If you're going to spend $4 on one or the other, we may as well fill sweet Thompson's bookshelves with some fabulous reads! Now is when I'd love to hear some of your ideas. What have you seen or heard about recently for baby shower trends that you can share with me? The fruit in little mason jars are so cute. They are not only a great snack, but also add some decoration. Favors are always hit or miss for me. At my kids birthday parties I always give an edible favor because I hate when they get a bunch of random crap that is going to be left all over my house. :) I like the favor idea with the cute hairties. I think those would be a big hit. Such cute ideas already! My first baby shower was a co-ed shower with a taco bar and margaritas. We lived in California so it was perhaps more of a CA-vibe than a Southern-vibe. ;) It was such a fun event, even if I couldn't partake in the margaritas. I think edible favors are always a clear winner! On another note, so exciting for you and your sister to be pregnant at the same time! I have a younger sister (4 years apart) and we are jokingly trying to plan a third pregnancy for me to coincide with a a first one for her. We'll see.... Anyway, have so much fun planning!! I second the edible party favors. I would much rather have a delicious cookie or brownie than a random gift. My go to party recipe is bruschetta and crostini. I am throwing a baby shower in the spring and snagged some rose gold utensils (plastic) from Michael's for $2 - they're so cute, and inexpensive (and hello, disposable!) 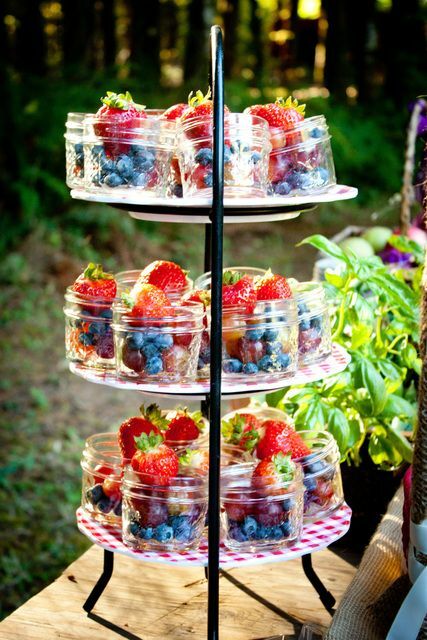 I love the photo of the fruit in mini mason jars! Hope that the shower is a great success and can't wait to hear the recap! I love the hair-ties!! I went to a baby shower last year and they had succulents in little terra cotta pots for the guest favors!! I thought it was a such a unique idea, and still have mine on the window sill above my kitchen sink! Good luck! Looking forward to hearing all about it! Getting the flowers delivered the day before?? All of their flowers look so pretty, great idea! Why have I never thought of that?! I recently got flowers at Costco that were so pretty and soooo much cheaper that I said I'd buy there again next time I need flowers! At my sprinkle everyone took home a little flower arrangement (in a pumpkin) since it was in the fall. That was a great favor! Fruit Salsa and cinnamon pita chips are a go to for our parties!! It's really pretty in a silver dish and super tasty!! I'm pregnant with my first and my husband's little sister is due with her 2nd two months before us. It's such an exciting time but my poor MIL keeps getting the ultrasounds mixed up and confused whose baby is whose ha! I've seen something really cute on Pinterest for favors. It's a little cardstock card that says "Thanks for making ____'s baby shower the balm!" and has a pregnant lady on it, with an EOS lip balm as her belly. I also received handmade shower scrub mixture in a miniature mason jar at a wedding shower. Just some thoughts! I'm hosting one for a friend in 2 weeks! Vistaprint was great for invitations. They had a sweet one with whales and hearts that played off nautical, but wasn't over the top anchors and sailboats. It dictated the whole theme. Since the shower is on Saturday of Valentines weekend, I took advantage of heart-everything and then added in turquoise and waves and whales. For favors, I got mini glass milk bottles tied with a turquoise ribbon and everyone will take home baby's breath and mini roses. Decorations+favors. My challenge has been the mom-to-be has GD so I want to be sensitive to that for the menu. We are serving egg stratas (light on the bread), a baked ham with finger rolls (that she can leave off), fruit salad and mini yogurt parfaits. I like the idea of cucumber cups too, as I found out we have vegan, vegetarian and gluten-free guests. Lots of accommodations. I learned everyone is different in their triggers for GD - some are carbs, some fruits - so I just asked my friend straight out what would work for her. Fruit is fine for her, but carbs are what she needs to avoid more of. I offered angel food cake cupcakes or mini cheesecake alternatives from a diabetes cookbook, but she said she wants to enjoy one real cupcake and her Dr. said it will be fine to indulge in a treat, so red velvet cupcakes with cream cheese frosting it is! We just had a baby shower two weeks ago for my niece. I recommend a sugar scrub for a favor (tag said from our shower to yours) where we got small mason jars and found on Pinterest recipe of baby oil, baby magic sleepyte/lavender and sugar. Smelled great! We also colored the 'HE' part on a Hershey bar. We added stickers to packages of popcorn that said "She's about to pop!" We also did a diaper raffle. If anyone brought a package of diapers, their name was entered into a drawing and we had three great prizes to give away-a movie package, pasta package and a spa package. Happy planning! I'm a fan of the books-instead-of-cards movement... as a guest it's much more fun & personal to gift a book! :) We just did an adventure themed shower for one of my girlfriends and made a big stew for the day, had a sweet potato and baked potato bar, and did fondue and smores- all was a big hit! For favors, I've always used something edible. We did "caterpillar food" for the Very Hungry Caterpillar themed shower, individual apple pies for the Baby-Q, and little mason jars of honey for a garden/ bee themed shower. I'm not sure what I am doing for the one next month but most likely something with sprinkles. Those hair ties are seriously adorable though!! Allll about the books instead of cards, and I love reading the little note inside of the book from the guest - but be weary of stickers....we did that and got a lot of duplicate books that I couldn't return because there was a sticker note inside!! I've hosted a few baby showers during the last few years and one of my staples for food is Chicken Salad on Croissants. We have a couple of local places that sell amazing chicken salad by the pound, and then Sam's sells the most delicious, buttery croissants 24 to a box. They're easy to put together and they're pretty filling as well. Plus, the croissants always look so pretty on the tray! Thank you for he flower rec, I just ordered some for Valentine's Day! Great service. My sister in law gave away elephant shaped sugar cookies at her co-Ed Baby-Q. They were beautiful and something great to take home, especially for parents with kids! My cousin and I just had a baby shower for our other cousin who is also having a sweet boy! For favors we did blue and silver Mnm's tied with bakers string and monogrammed TY tags! We found them off of Etsy! I love the book idea instead of the cards. So sweet! We did monogrammed cookies for the favors. Love the book idea! Planning showers is so much fun :) Enjoy! You've gotten about a billion & one suggestions & you're an amazing planner, but I thought I'd throw this out there... I went to a shower where a lot of the food revolved around the mother to be's cravings. It was actually super cute. She had a sweet tooth so it was everything from lucky charms to little Debbie cakes. OPI has a Baby Blue nail polish shade and Maybelline I think makes Baby Lips-you could get the blue stick since it's a boy. Those are useful. A popcorn bar as a favor for guests to get a sack of different popcorn would be cute for her about to pop. Those zucchini pizza bites look so good! Making my mouth water looking at them. Have a great weekend.